Murlo has an enticing looking website, and showcases an idyllic Renaissance landscape. 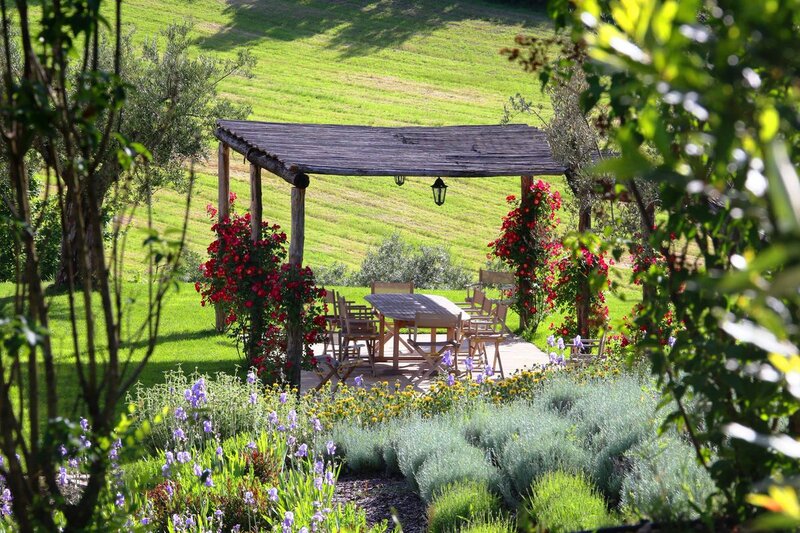 The reality in so much of central Italy is often of villas and country hotels cheek by jowl with expats from London, Frankfurt and Amsterdam - but the Tenuta di Murlo proved to be even more idyllic than the story it put out. The estate itself covers several thousand acres and has been in the same Italian noble family for over 250 years. 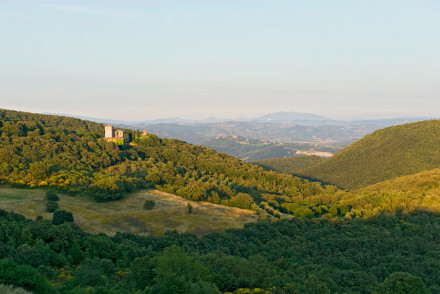 Being so vast, and in an area of Italy less accessible than Tuscany to the north, it’s in an enviable position - both secluded, with limitless unbroken views with few habitations in sight, and ideally positioned for excursions to the finest cultural highlights in Europe. Over the years this estate had, one assumes, become something of a backwater, so the present family, a Roman lawyer and his charming wife Carlotta, have turned their attention to slowly doing up, one by one, a selection of the 90+ tumble down old farm workers' houses and cottages into luxurious villas for rent. To date they have completed five - Caminata, Torre, San Savino, Santa Croce and Subtillia. These are reached via several kilometres (in some cases) of dirt track, so hiring a car here is essential, though Perugia airport is only 25 minutes away, and Rome and Florence a couple of hours. Each villa has its own unique character, decorated in individual style under Carlottas’ careful eye, with plush sofas, cool sitting rooms, thick masonry walls against the summer heat, huge master bedrooms, and fabulous gardens and terraces with views for miles. They all have their own swimming pools, and a few of the villas can be split up into apartments for smaller family groups, while several lend themselves to the perfect summer house party for multiple families with kids. There are also a couple of small, intimate cottages for romantic couples. For services, the villas have daily maid service, plus a breakfast in a box delivered from the estate restaurant, and meals can also be cooked by the restaurant's chefs in situ, if required. However, the wonderful local produce - collected via a 20 minute drive to the supermarket in the local village - should tempt you to stock up with salamis, truffles (this is truffle country), hams, cheeses and all the rest of the yummy eats that Umbria has to offer. In all the villas the gardens are spectacular, and the silence and stars at night remind you sometimes of a farm in Africa - an impression reinforced by the landcover that appears each morning with your breakfast, and the gentle whoosh whoosh whoosh of the water sprinklers in the cool of the morning, and the gathering dusk. The restaurant itself is at the entrance to the estate, next to the 18 hole Robert Trent Jones Jr designed golf course, so for golfers this is a paradise, though for non-golfers it’s far enough away from the villas for this not to feel like a golfing resort, which it certainly isn’t. The restaurant serves a mix of good local dishes, including the wonderful bistecca alla Fiorentina, as well as wood fired pizzas, with regular bbq nights and an excellent wine list. All of these dishes can be recreated and cooked in your villa by the restaurant chefs if required, or delivered in the fleet of estate landrovers. To relieve the seclusion - this would be an ideal place for a novel writer, for example - the position of the estate makes it a near-perfect base for exploring the cultural gems of central Italy - Todi, Assisi, Cortona, Florence, and Rome, as well as charming local hill villages you will never have heard of, such as Montone. Last, for those of us who can’t do without being plugged in 24/7 to the wider world, or who want to get away for a working holiday in warming Italian sunshine, dealing with office politics beside the pool, there is blistering fast wifi. So for this writer certainly, La Tenuta di Murlo has a perfect combination of total comfort, restful seclusion, stunning landscape, fabulous food, and easy to reach culture when you want it. The only thing they are lacking is an estate spa, though they do offer in-villa treatments, yoga, and guided meditation. But they are working on the spa. Watch this space!